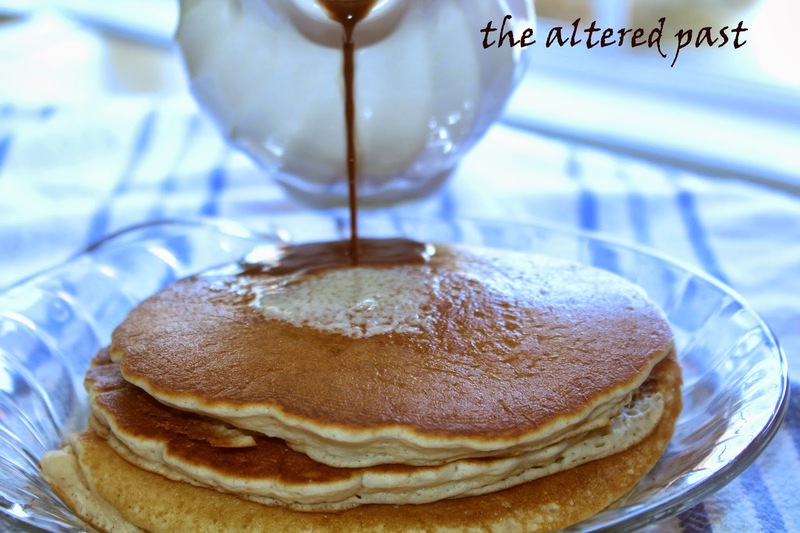 National Pancake Day - I Added the Chocolate Syrup! 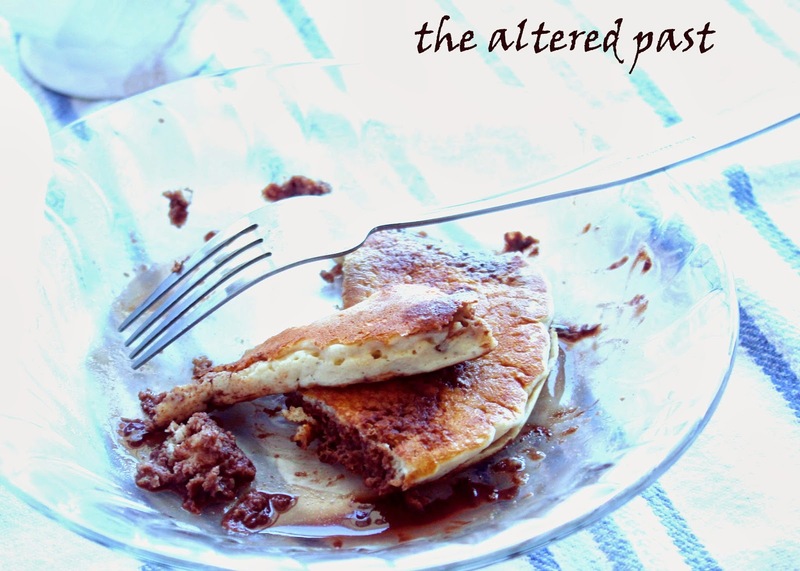 Make that pan-a-cakes, if you're in our house. 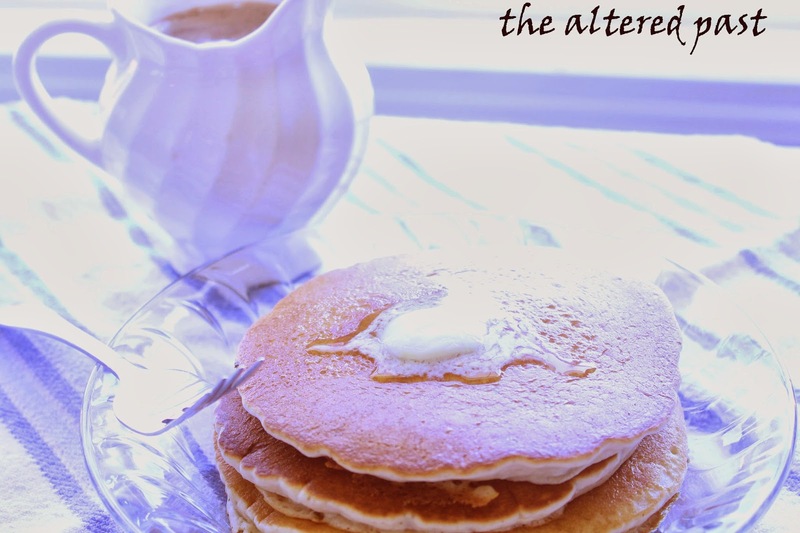 Who doesn't enjoy a stack of delicious piping hot pancakes for breakfast. 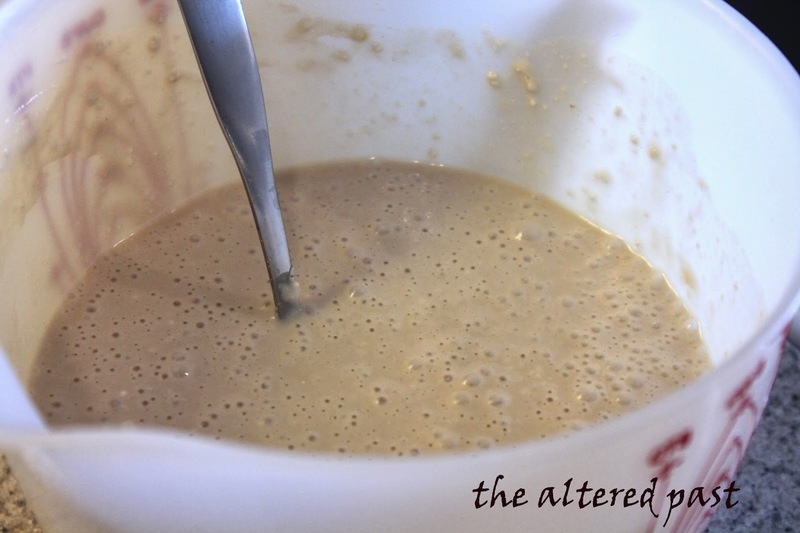 You can easily make pancakes from scratch but I use a baking mix and then "doctor" up the mix for whatever our fancy may be that day. 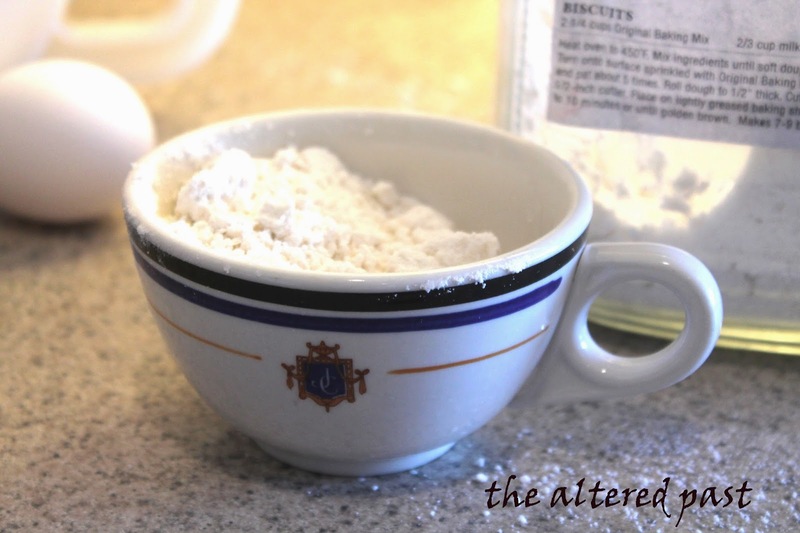 Just because you use a boxed mix doesn't mean you have to keep it in its box. 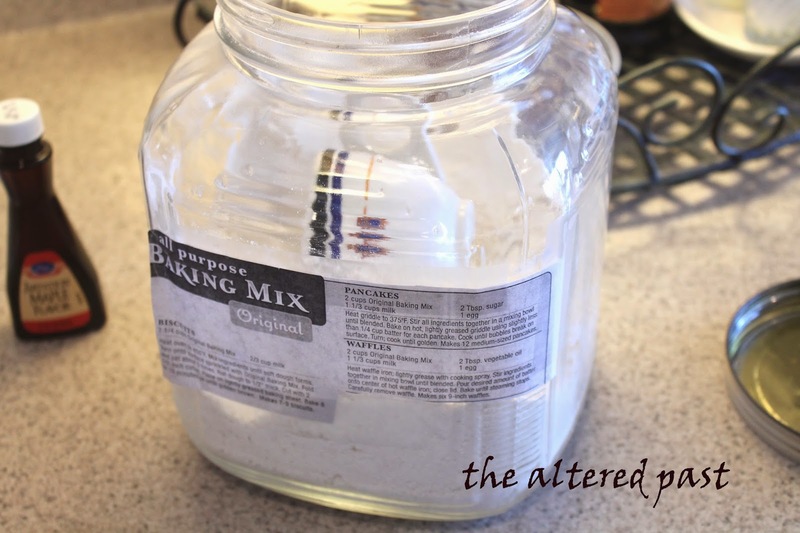 I use old pantry jars to hold most dry goods. 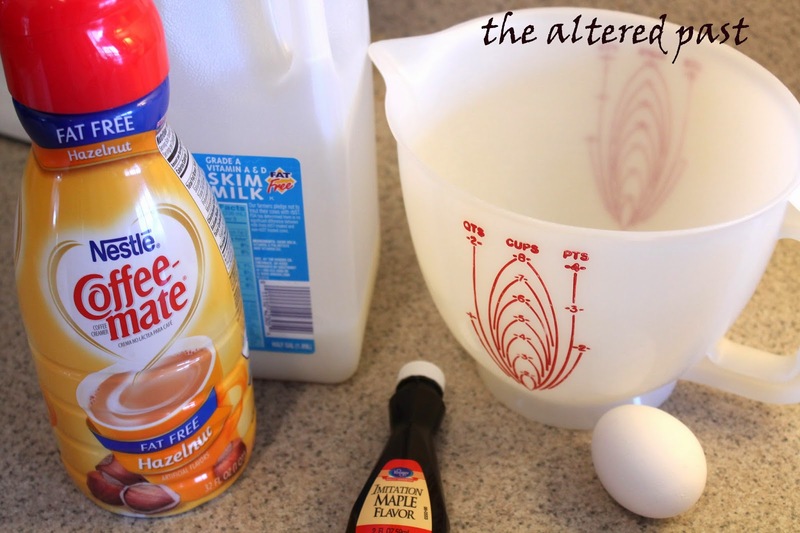 If you need the measurements for biscuits, pancakes, etc., just copy it from the box and tape it to the jar. 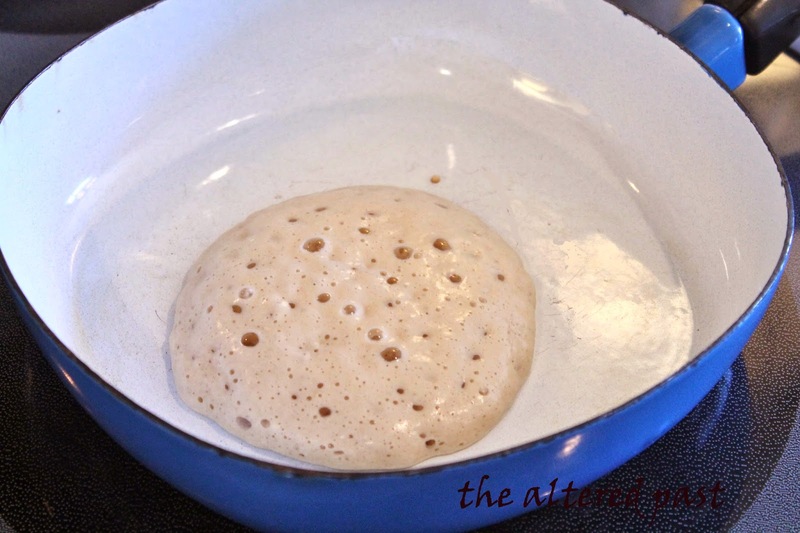 Mmmm....hot buttery pancakes. Ready for the syrup! Oh my goodness, I can hardly wait! 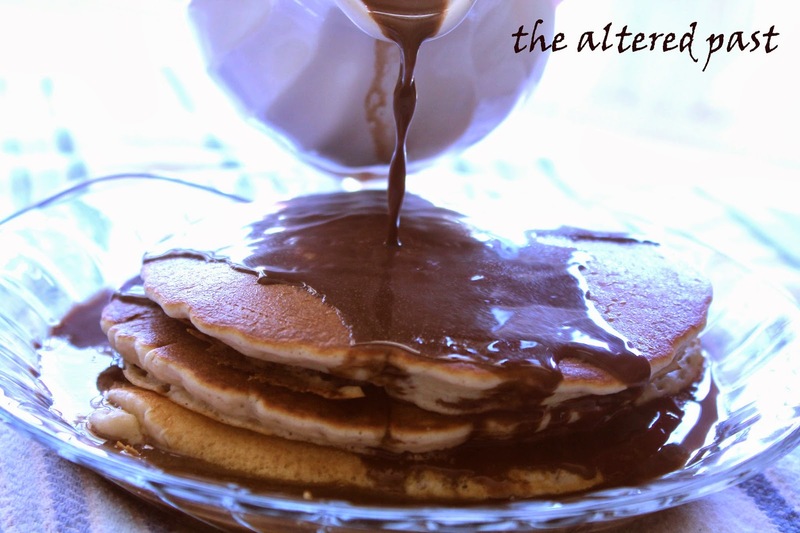 It's a good thing National Pancake Day is on a Saturday. I think I'm going to need a nap after these! 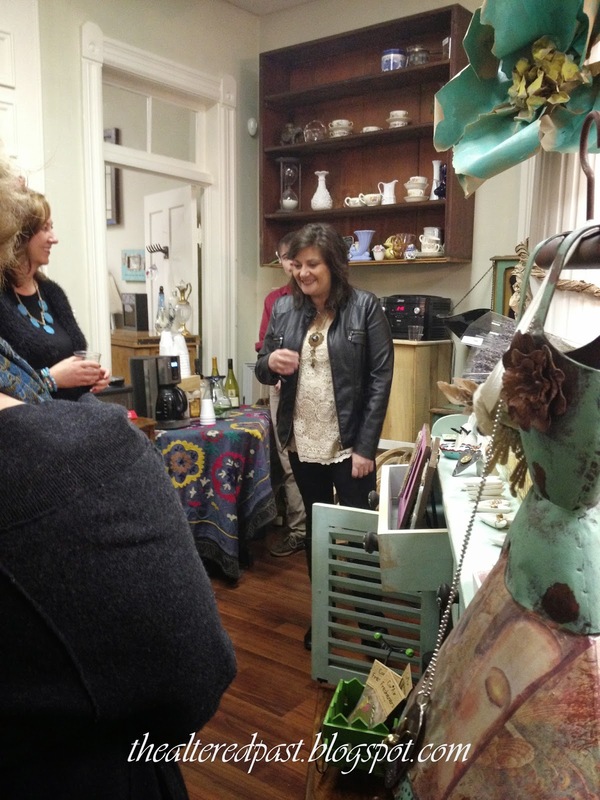 This week, our Nashville area bloggers group met at this incredible store located right here in Murfreesboro. Dreaming In Color is owned by Deneen Glidwell and is located just down the street from the historic Oaklands Mansion. 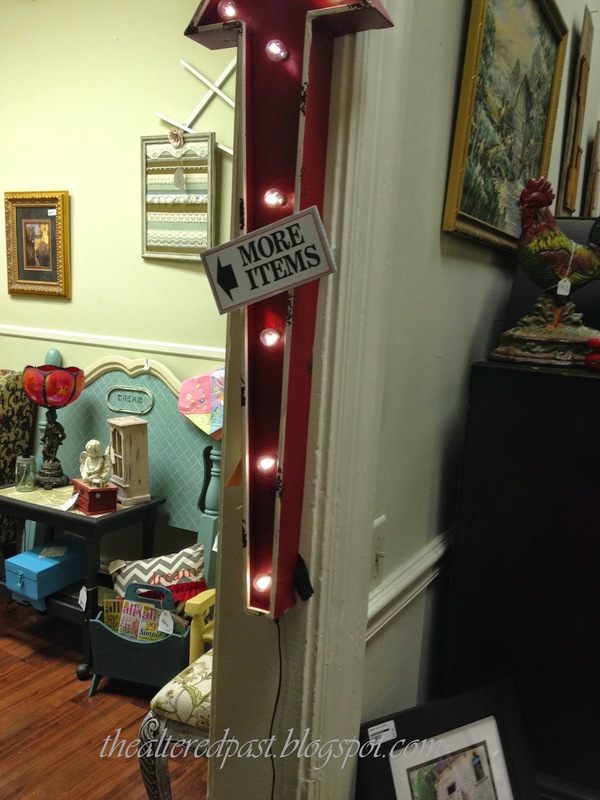 It's full of great furniture pieces, vintage items, and lots of handcrafted art. This is Deneen, our adorable host! Loved this piece! Unfortunately, it was already sold. Weird shot of the wall between two rooms...I was trying to get the cool arrow sign. Almost got it. These amazing pieces are made by Lucy Inspired. 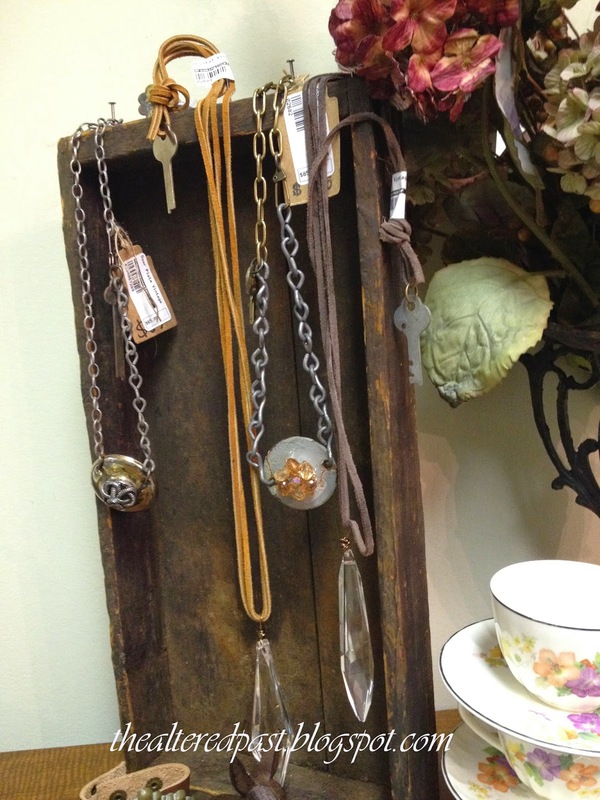 Love the way she mixes old found objects in her jewelry pieces. 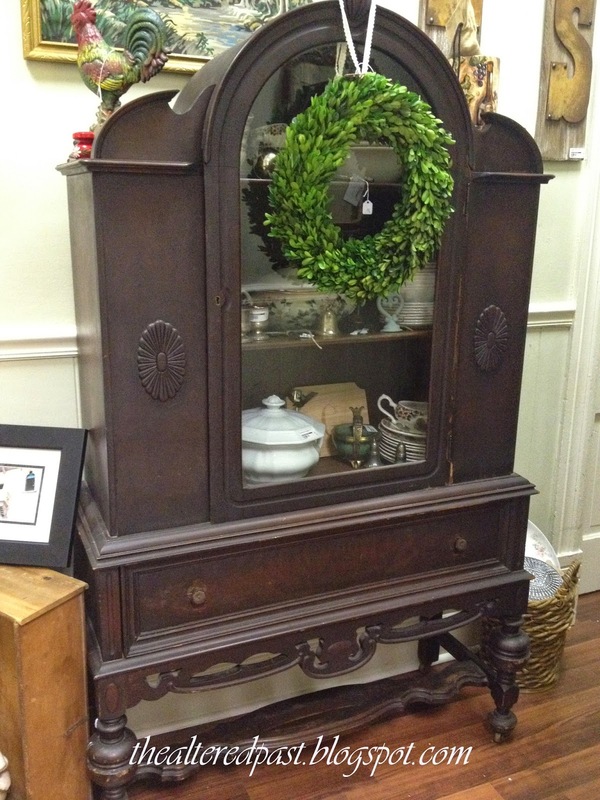 What don't I love about this display...gorgeous cabinet, boxwood wreath, and ironstone. I think this was my favorite of all the items. 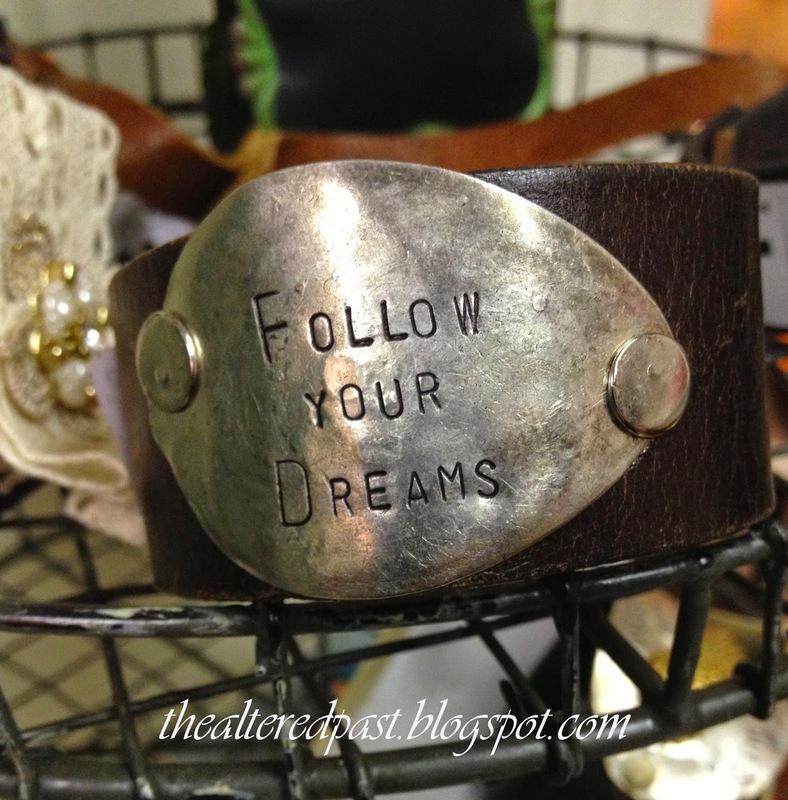 This is my year to follow my dream...and I'm going for it! 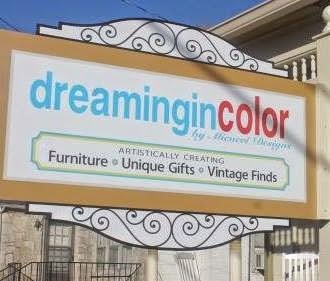 If you're in the Murfreesboro area, be sure to check out Dreaming In Color located on N. Maney Avenue, located in the historic area. I found out last night that Deneen's building has quite a history behind it and there are close local ties to Judy Garland even. Pretty cool, huh? Welcome to Something To Talk About Link Party #5! 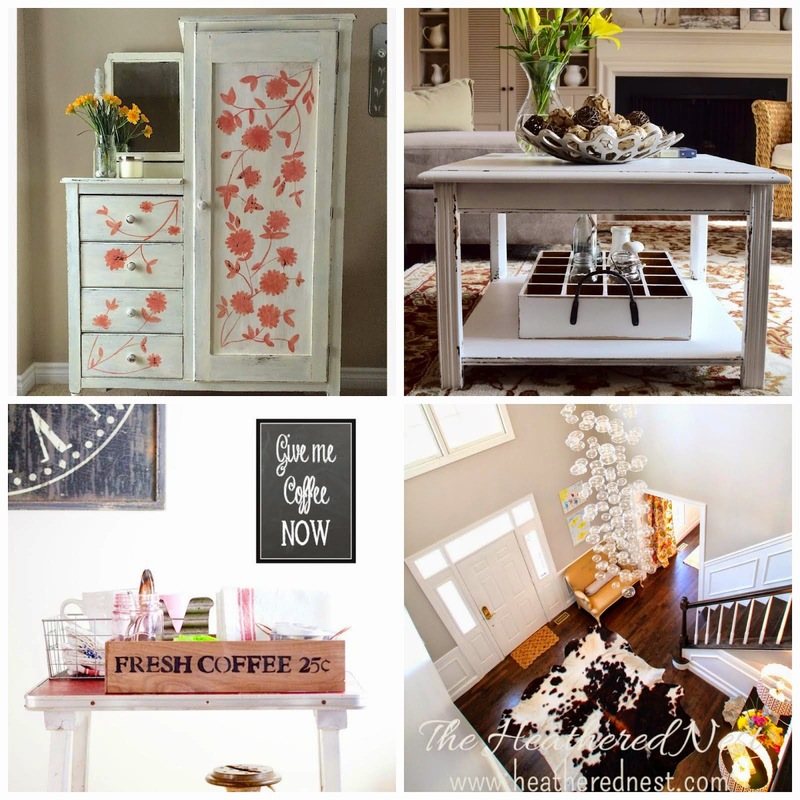 Each week I'm amazed by the creativity and inspiration that is brought to this party. As readers and followers of this blog, this is a great opportunity for you to be introduced to other blogs and their passion. 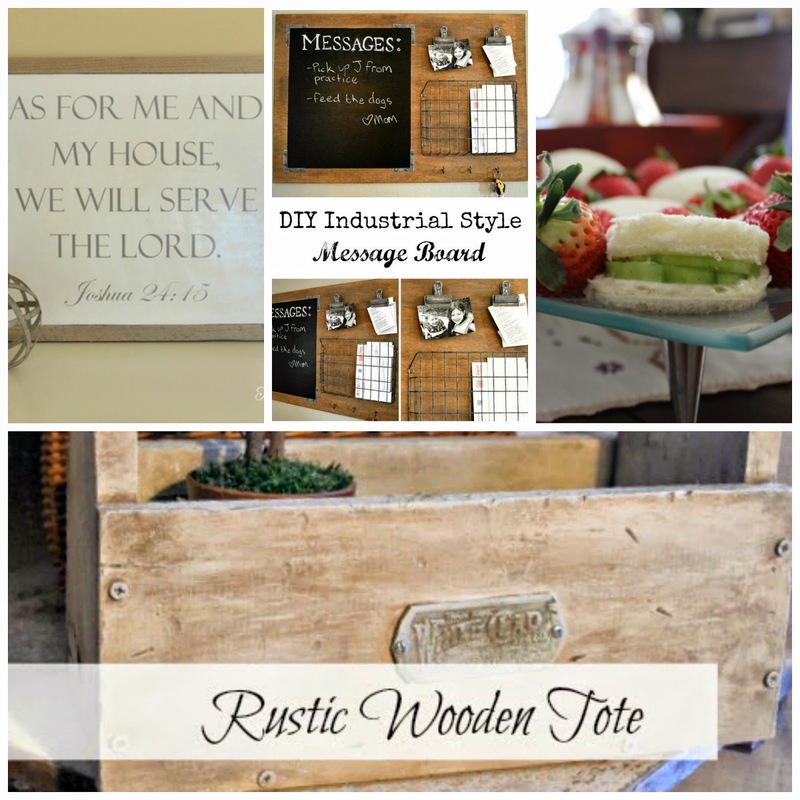 Check back each day until Thursday afternoon – leave a comment and let me know what your favorites are! Now, let’s get this party started!! 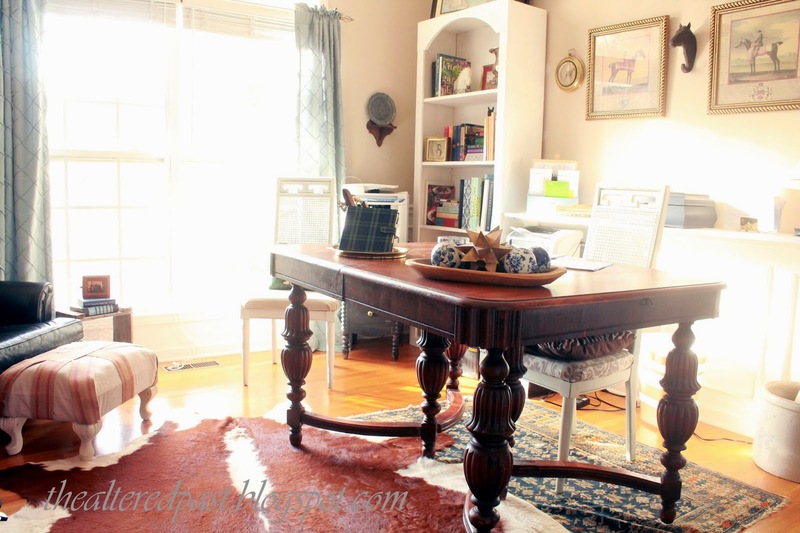 Recently I shared these two posts: the hunt themed office makeover that my 18-year-old daughter did for me; and, a quick and easy tip on repackaging bulk ground beef. 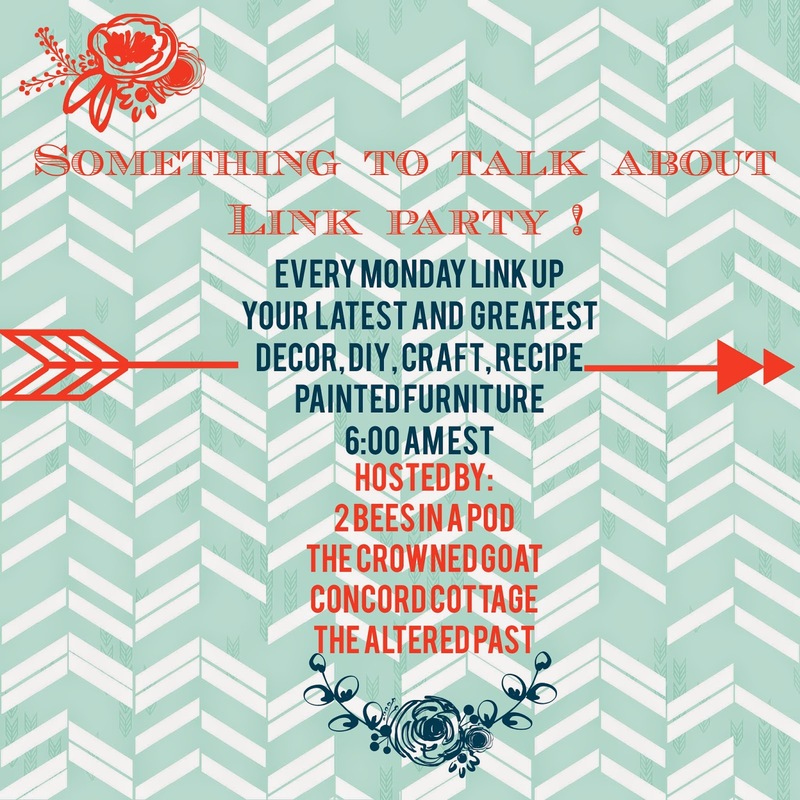 Let's move on to the features from this past week's Something To Talk About Link Party. 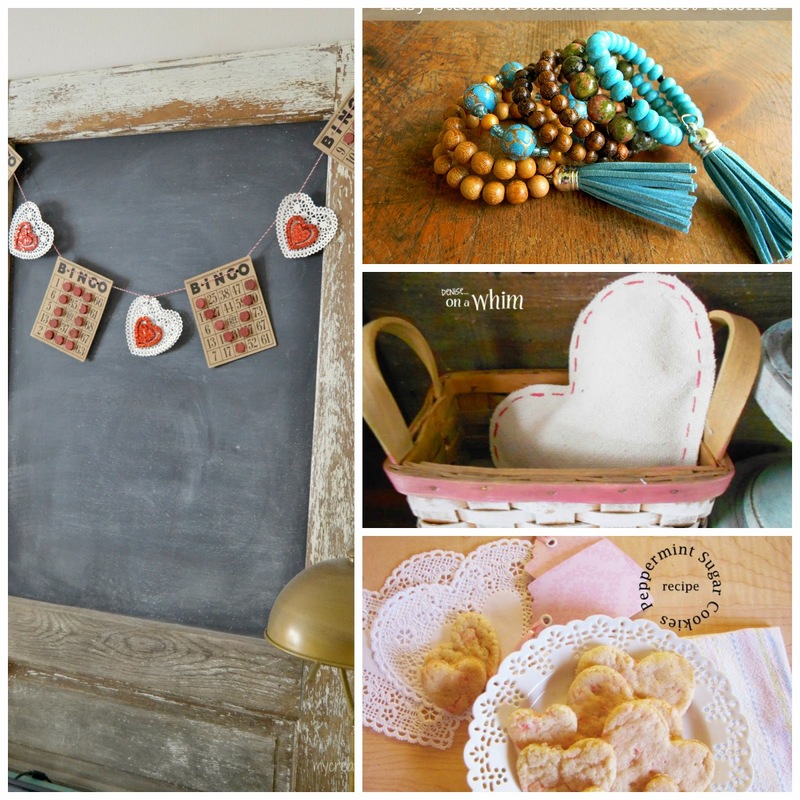 It was so hard, it IS so hard to decide each week because there are SO many great links. 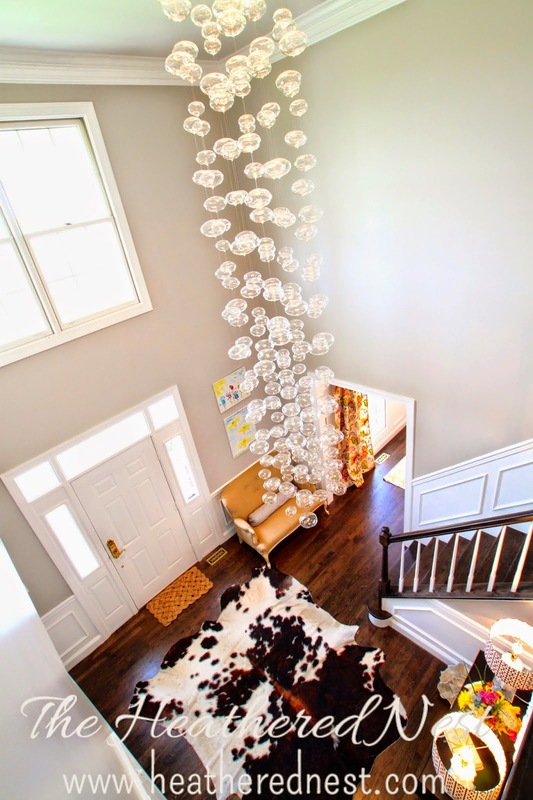 Heather of the Heathered Nest shared this beautiful bubble chandelier that she recently installed in her home. 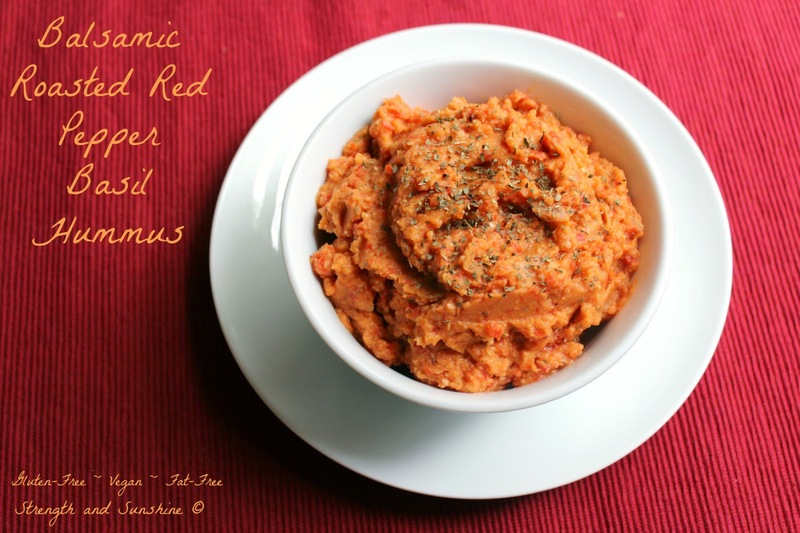 Rebecca of Strength and Sunshine shared her delicious looking recipe for Balsamic Roasted Red Pepper Hummus. 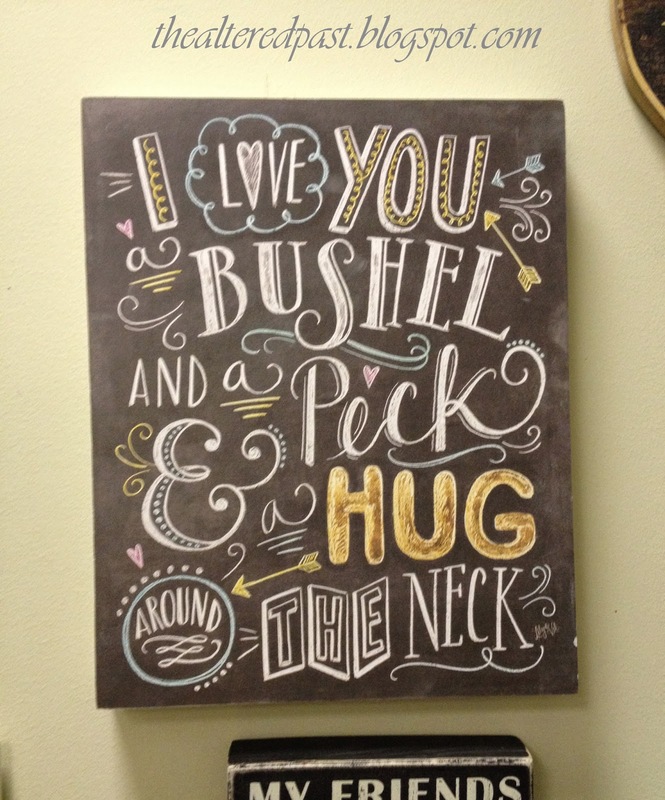 We go through a lot of hummus in our home so this is definitely a keeper for us! Thanks for linking up and God bless!! 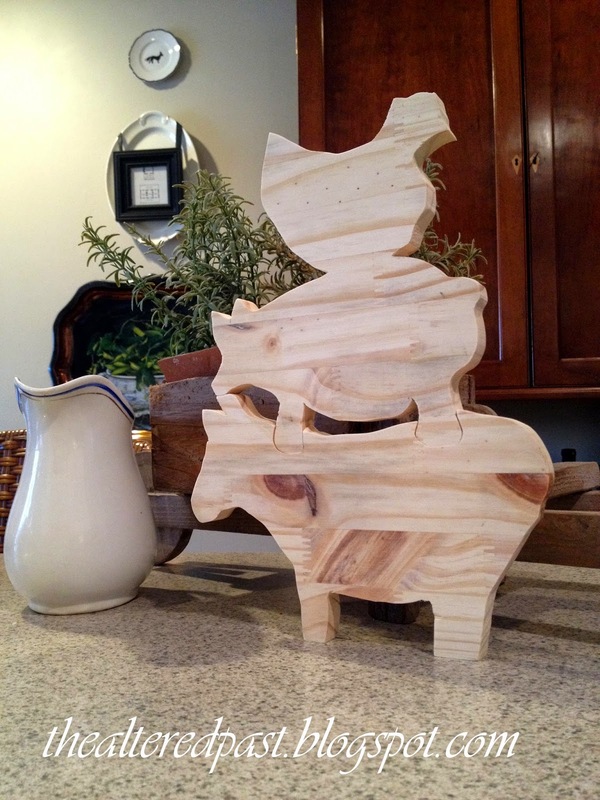 At our house, we are forever asking, "Where's the cutting board?" I guess it's because we home school, which means we eat all three meals at home most days, which means we are always preparing food, which means the cutting board is constantly being used. Know what I mean?? We definitely needed more cutting boards. 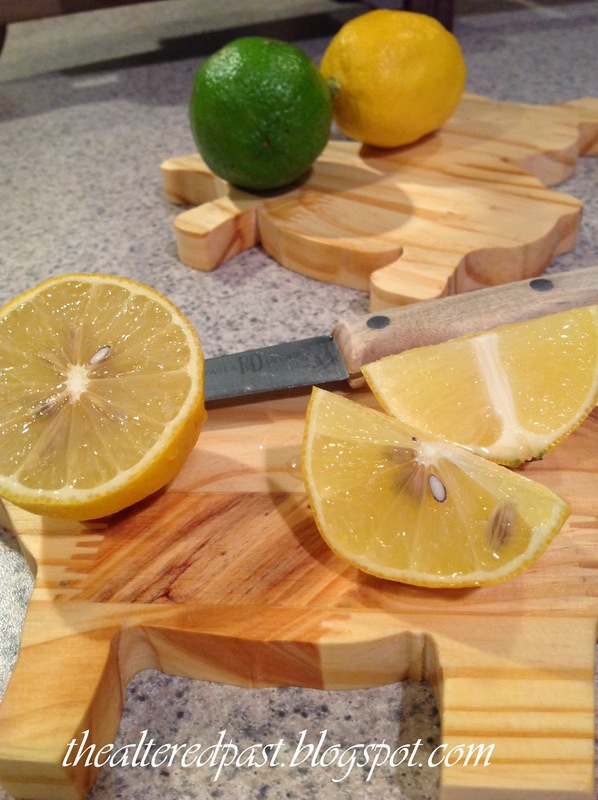 Not just more, but smaller ones for those small jobs like cutting lemons for tea or slicing veggies for a sandwich. That's when I decided to just make some. 1. Choose your design and draw or transfer it onto the board. I knew I wanted to make a farm animal design and the traditional chicken on the back of a pig on the back of a cow seemed perfect. 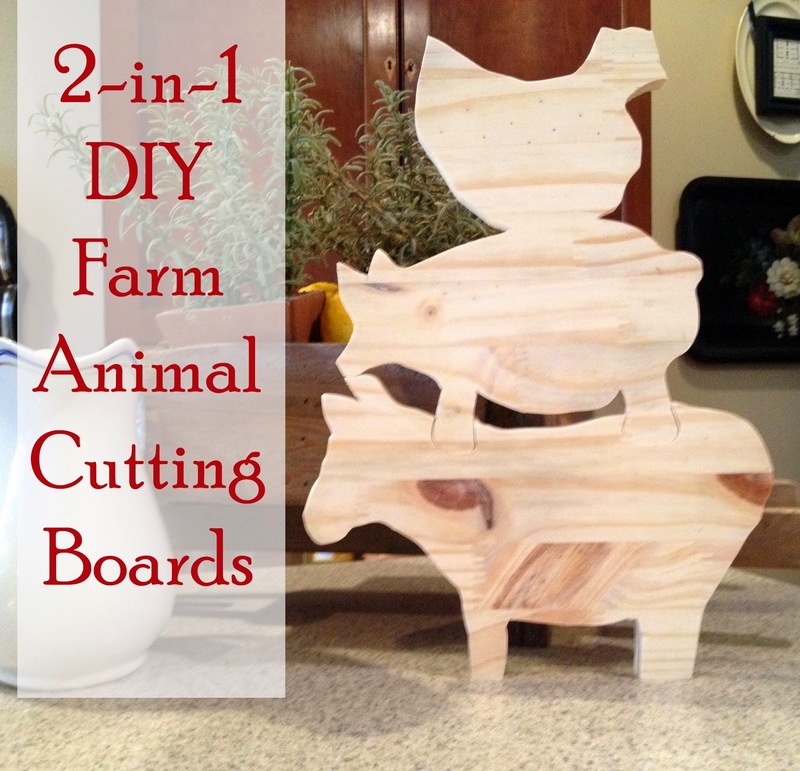 I cut a puzzle shape between the cow and pig so that the board could be used as a whole or as two separate boards. 2. 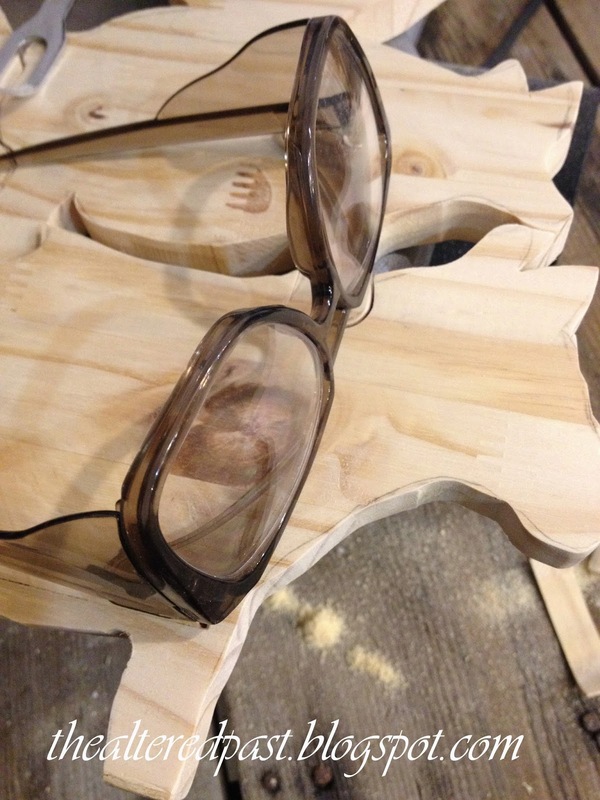 Wearing your safety glasses, begin cutting your design out of the board. Be slow and careful as you cut any curved shapes. 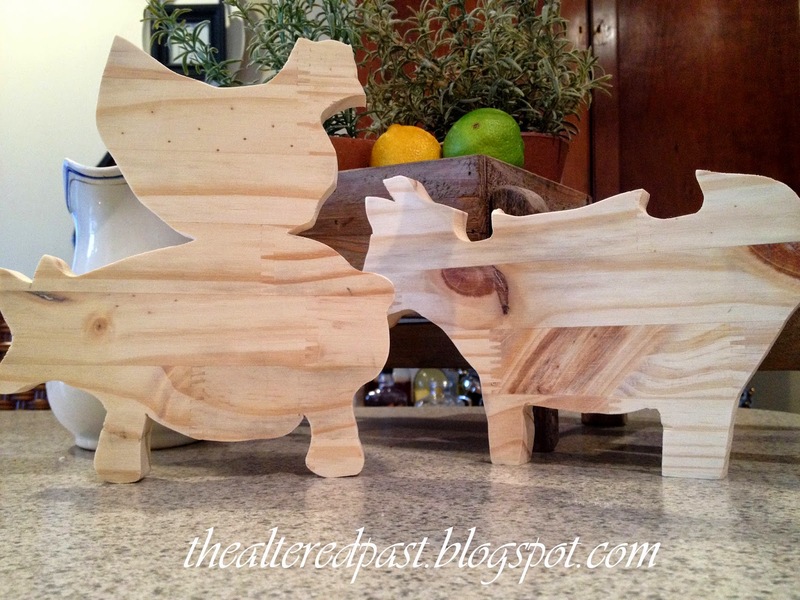 A scroll saw is great for making these cuts...just take your time and don't rush the cutting process. 3. 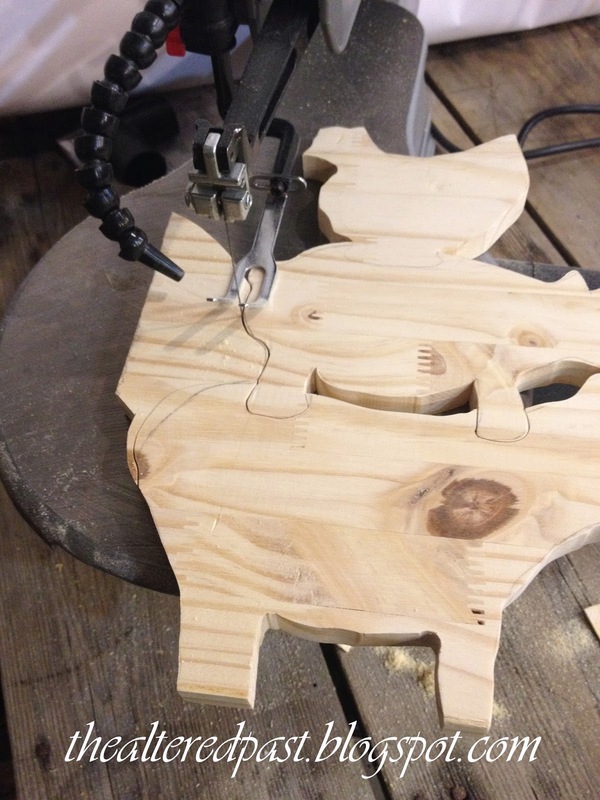 When I made the interior cuts between the pig and cow, I first drilled a hole. This gives you room to turn the blade (if using the scroll saw) or it gives you a place to begin (if using a jig saw). 4. 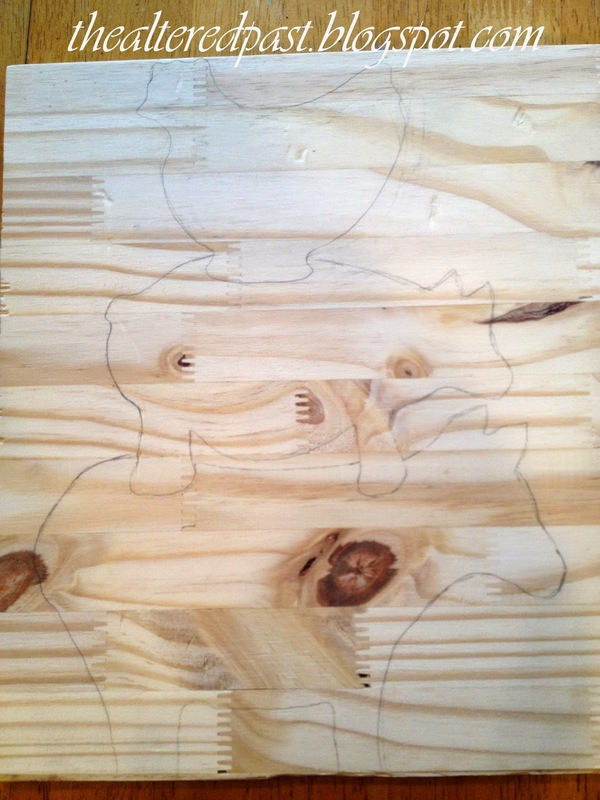 After all the cuts have been made, sand the edges and any remaining pencil marks with the sandpaper. 5. Now you're ready to seal your board. I used coconut oil because it's natural and will not turn rancid like vegetable oil. 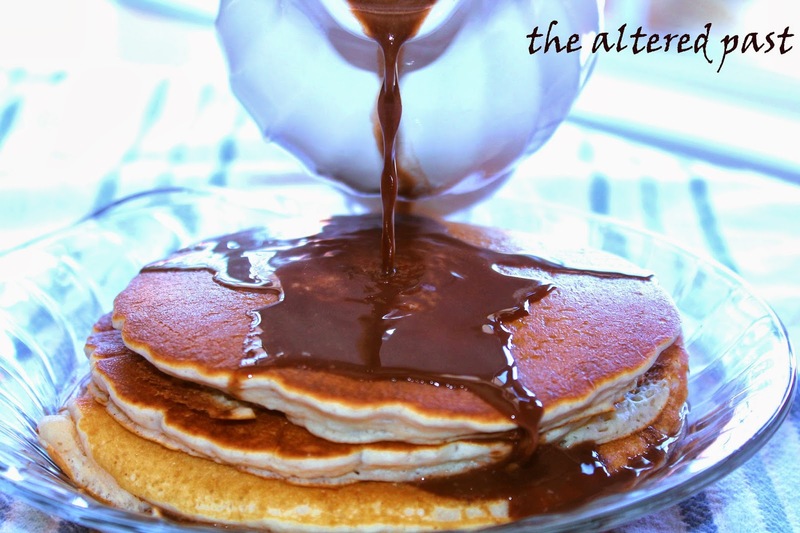 You do not want to use a protein or vegetable based oil! 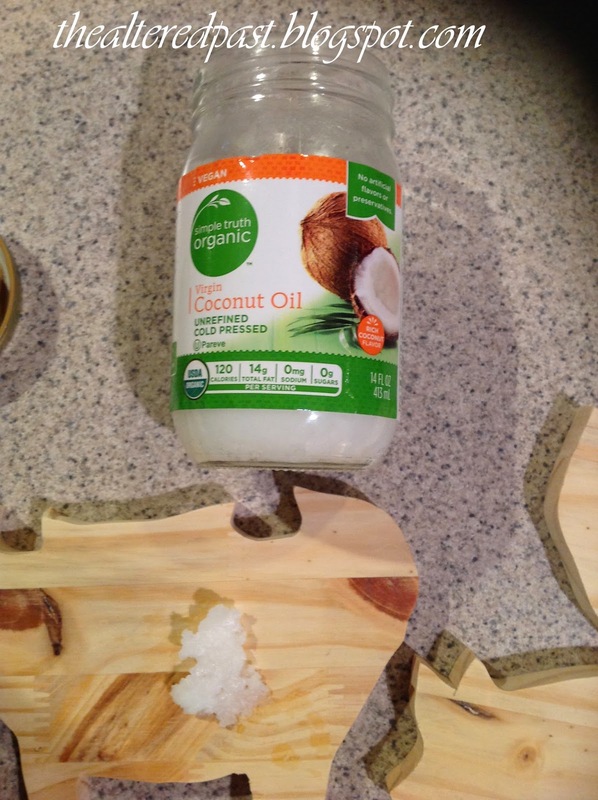 Begin by rubbing in the coconut oil with a clean cloth. Cover the entire board in an even coat. Let it sit for 12-24 hours in a warm place. Apply more to any areas that may need more and allow to sit again. Repeating until no more oil is absorbed. 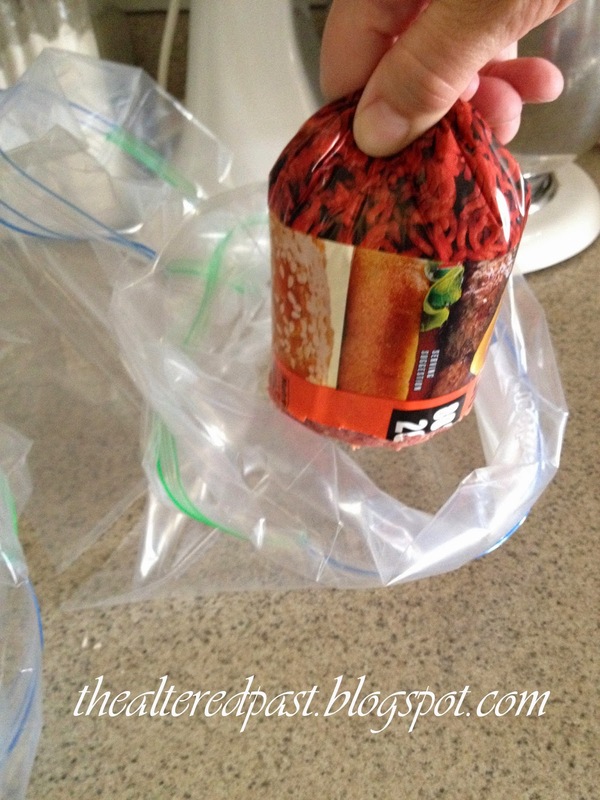 Wipe any remaining oil with a dry cloth and buff until it shines! You can repeat after a few months to keep your board conditioned. 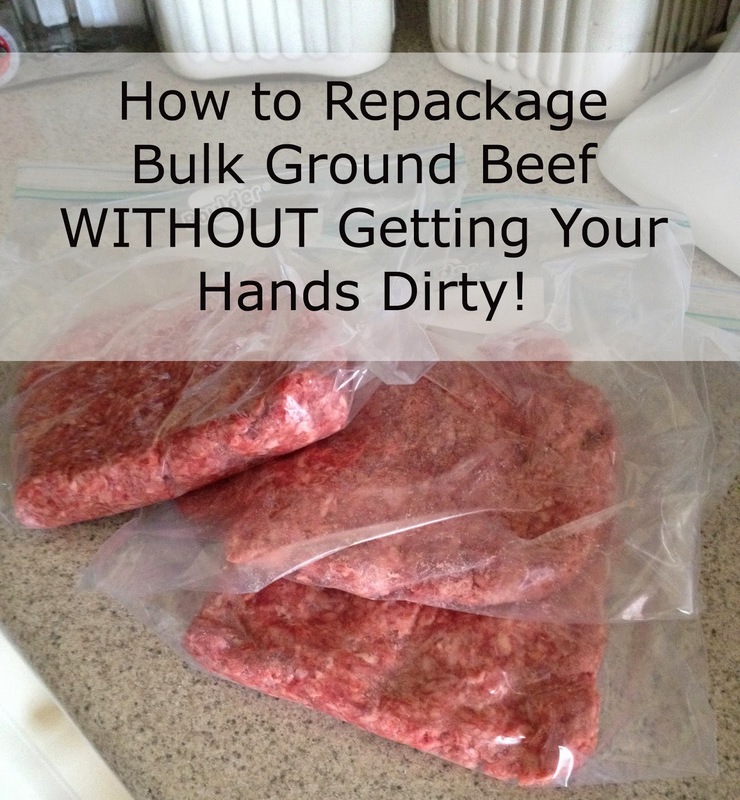 Quick & Easy - How to Repackage Bulk Ground Beef WITHOUT Getting Your Hands Dirty! 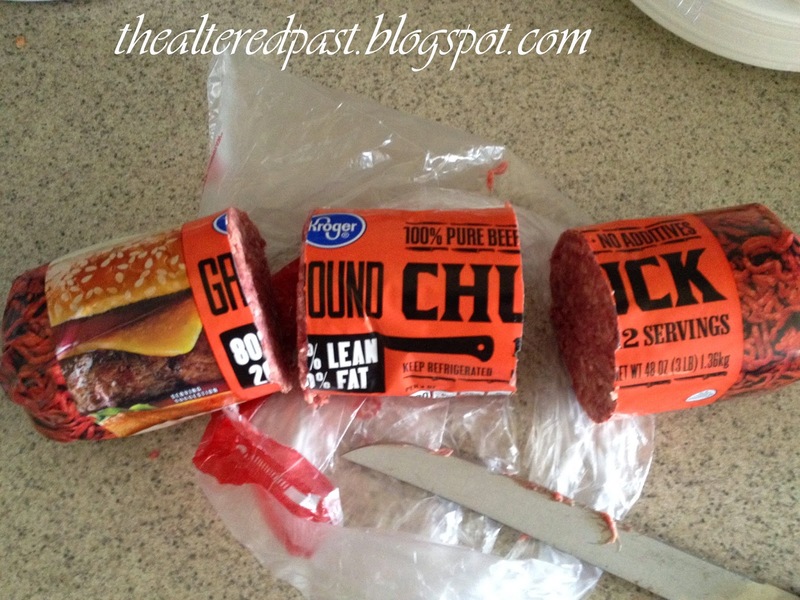 Today I'm sharing a super easy tip for dividing and repackaging bulk ground beef. 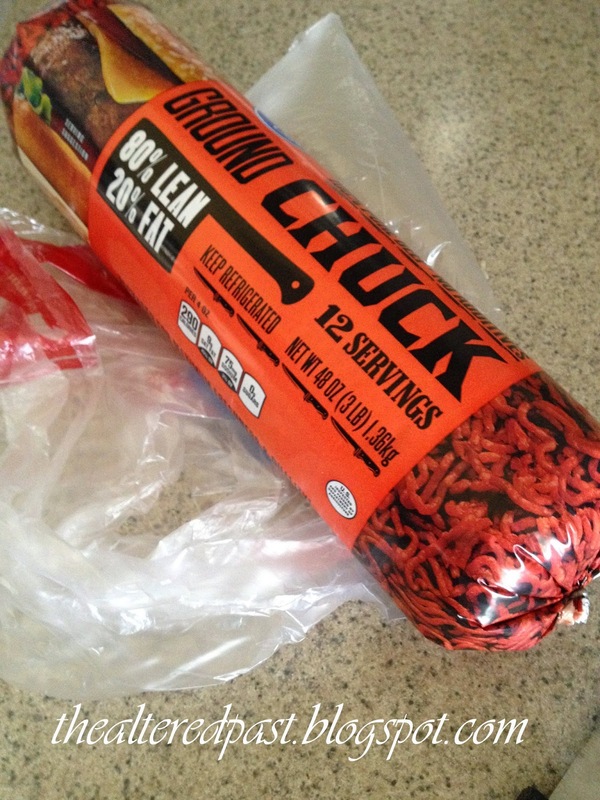 You know, those huge, bulk ground beef packages that we all get at the grocery store because the price of ground beef is cheaper by the pound that way, but then you get home and you're tired from shopping but that 5 pounds of bulk ground beef is staring at you and you're tempted to just throw it in the freezer as is! Yeah, I've done it. And regretted it. 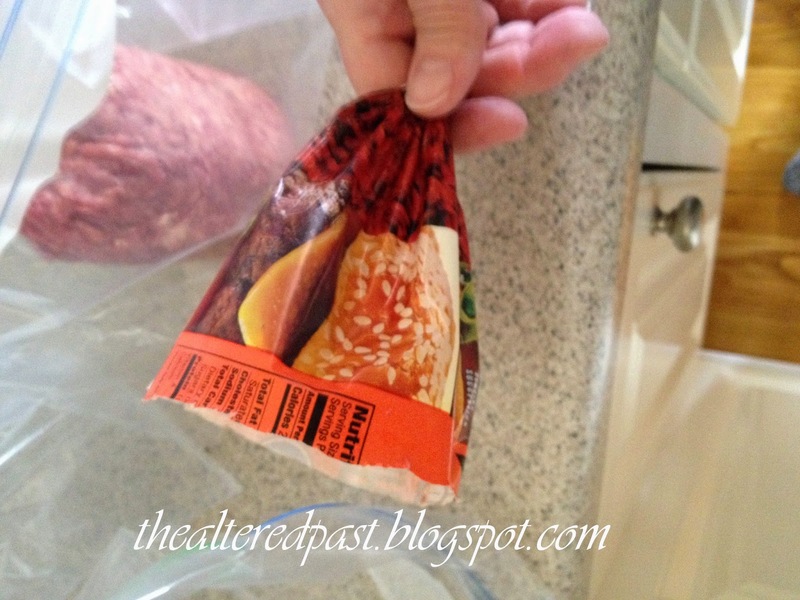 That's when I came up with this oh-so-easy method of dividing the beef and putting it in freezer bags, all without even getting your hands dirty! Start with your bulk package. 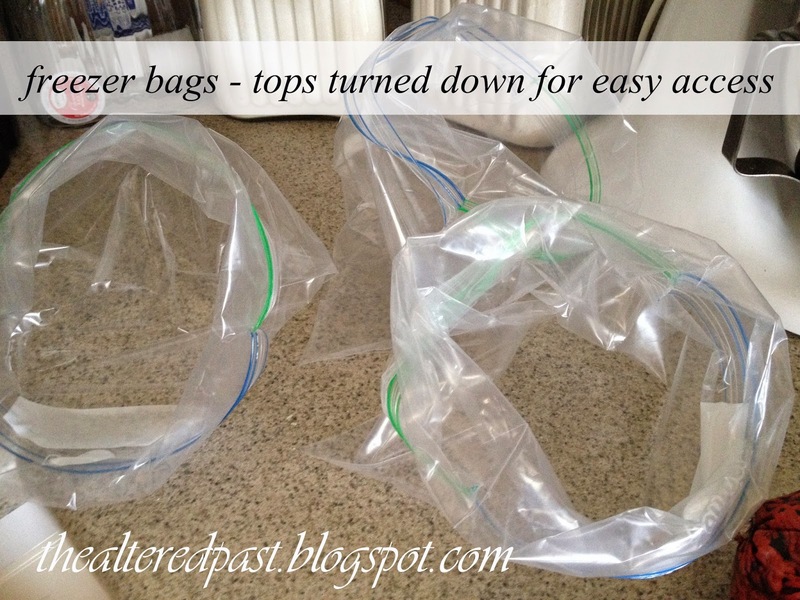 Save the plastic bag that you put it in from the store. 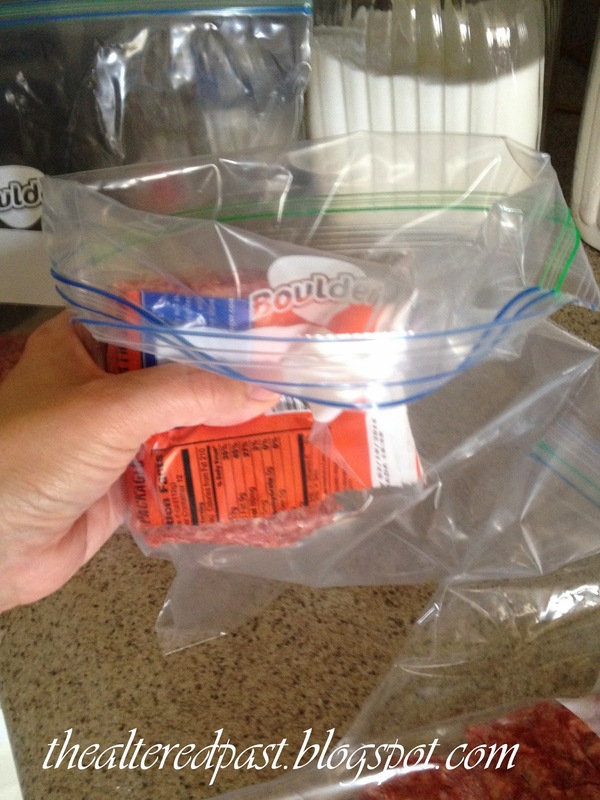 Using freezer bags, turn down the tops of each so that they stay open. Using a serrated knife, cut the beef into portions. This is a 3 lb. package so I cut it into thirds. Now, grab one of the portions. The ends are easiest. Placing it in the bag, I begin twisting the end. The beef will slide out nice and clean that way. Here's the middle portion. I pick it up by the plastic that's still around it. 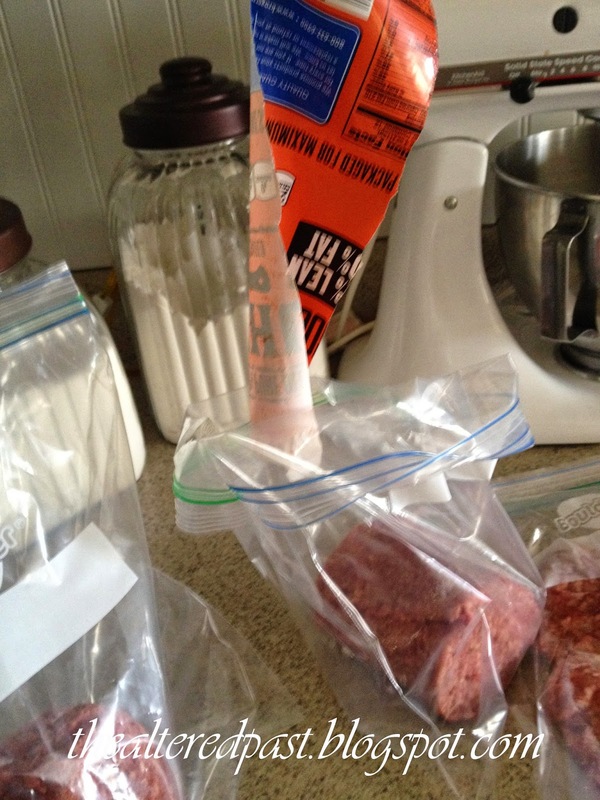 Use the serrated knife to slice open the plastic, leaving the beef free to fall into the bag. 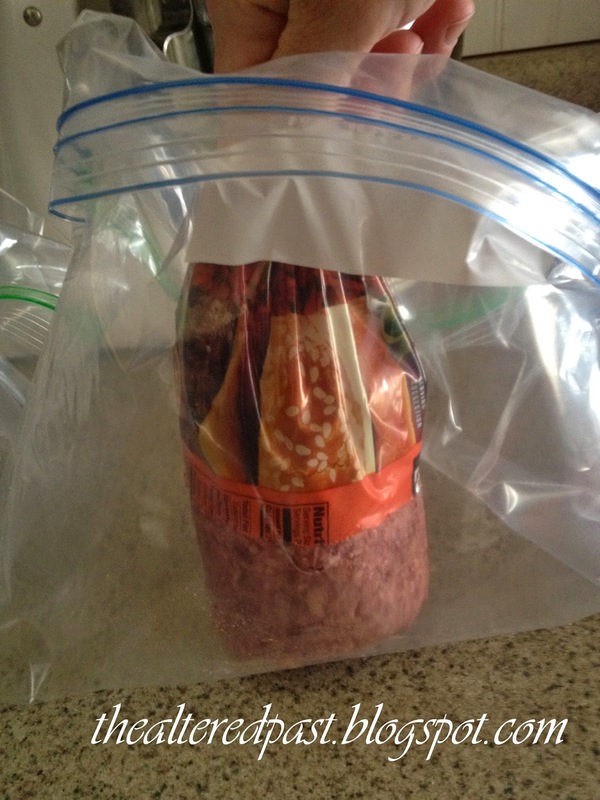 Now, the three pounds of beef are in bags and ready to freeze. I try to remove as much air as possible. 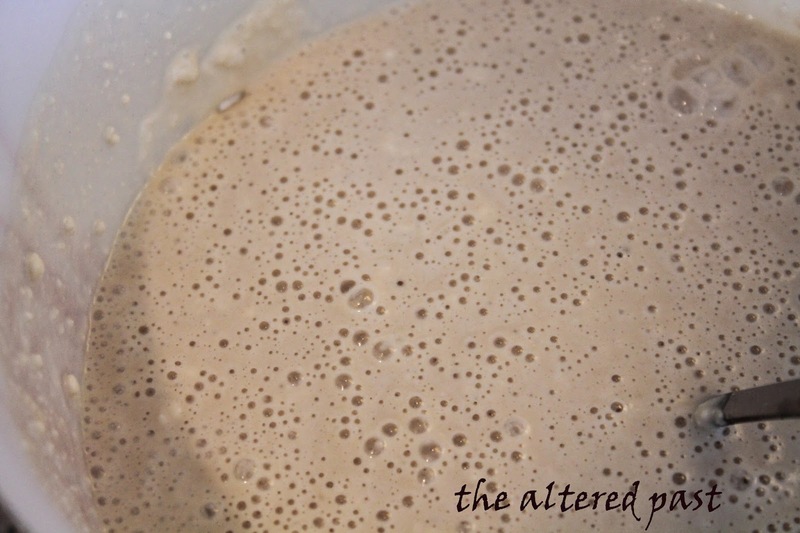 I also pat mine flat so that they'll stack in the freezer AND take less time thawing. Don't forget that meat department bag I told you to save. 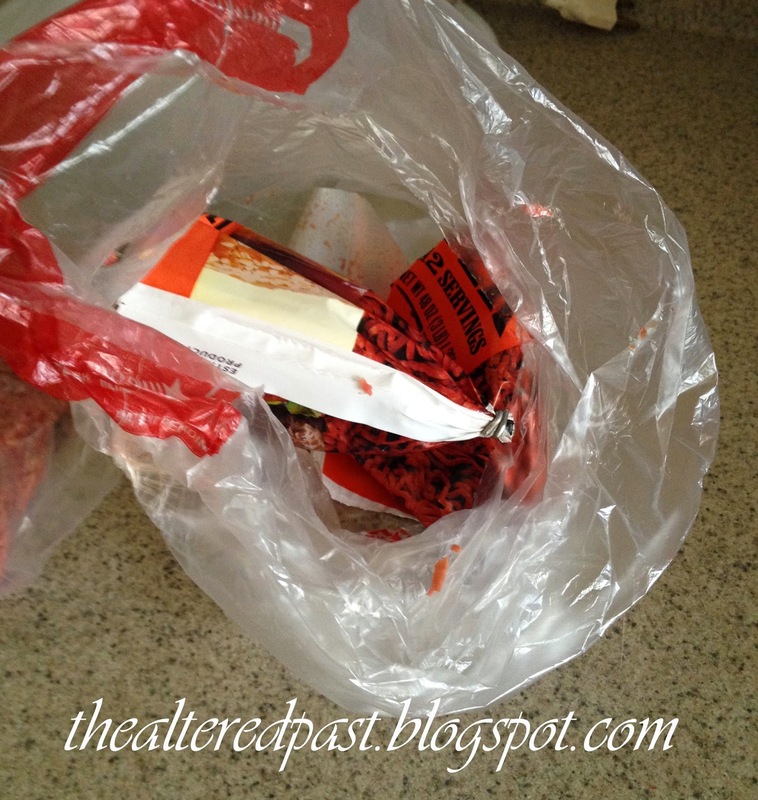 I toss the packaging into it and throw it all away. Now, you've just got a serrated knife to wash and you're done. I can usually do this in just a matter of minutes and minimal mess. 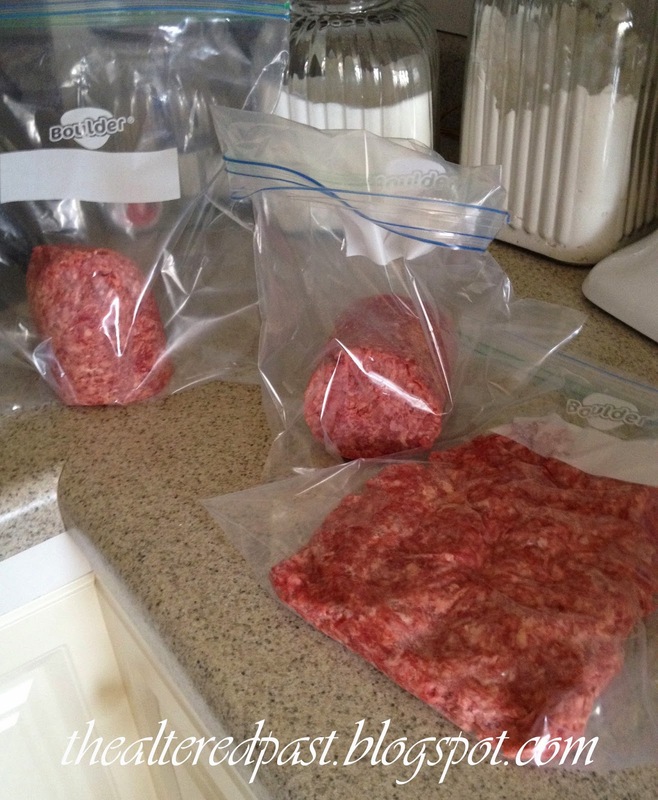 No more dreading having to divide the bulk beef or regretting that I threw it in the freezer whole! 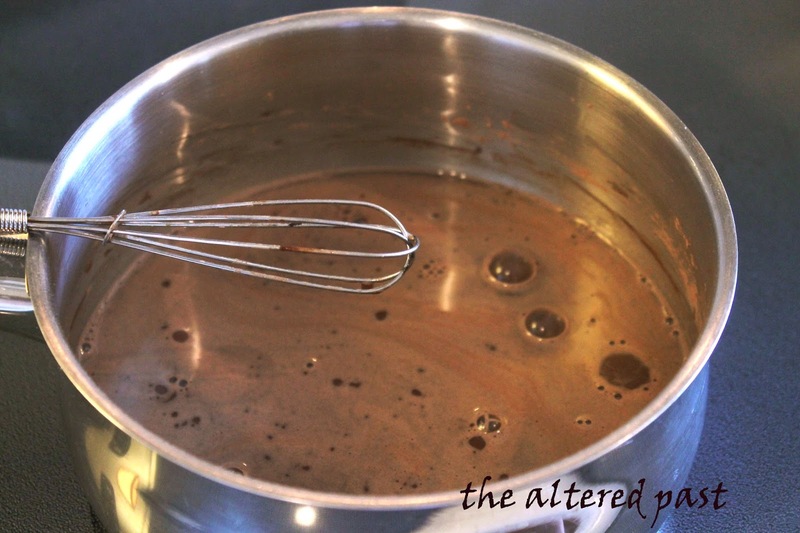 I hope this tip saves you some time in the kitchen! Here's a pic to pin! 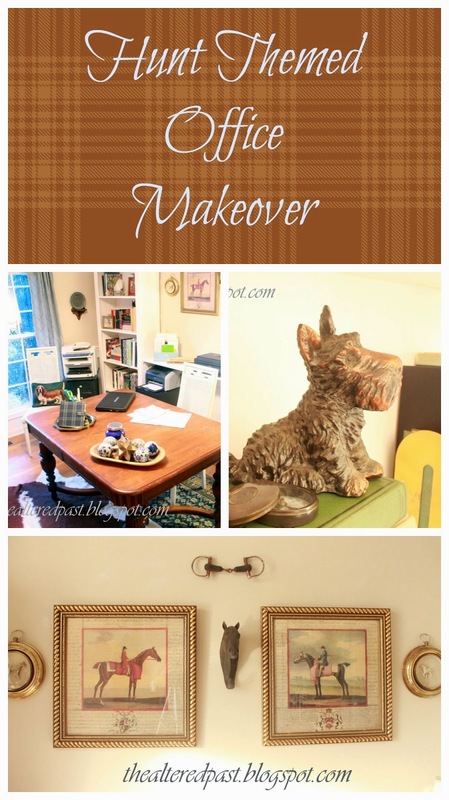 In case you missed it last week, here's what happened when I turned my 18 year old loose to makeover my office. How do you think she did? I'm excited about it! Now, let's move on to this week's party!! 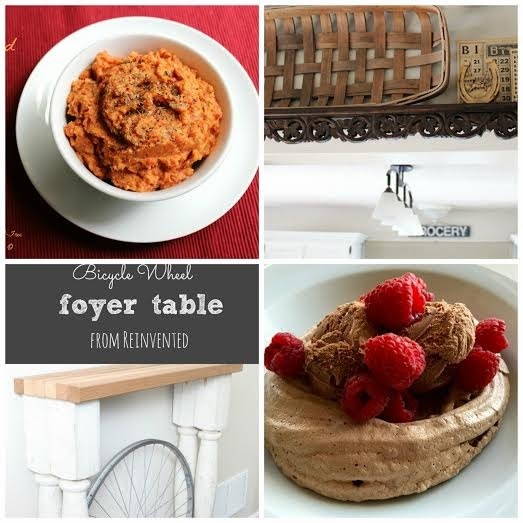 The Altered Past is happy to have featured these two wonderful links from last week. Kathe With an E shared An Afternoon Tea with us. 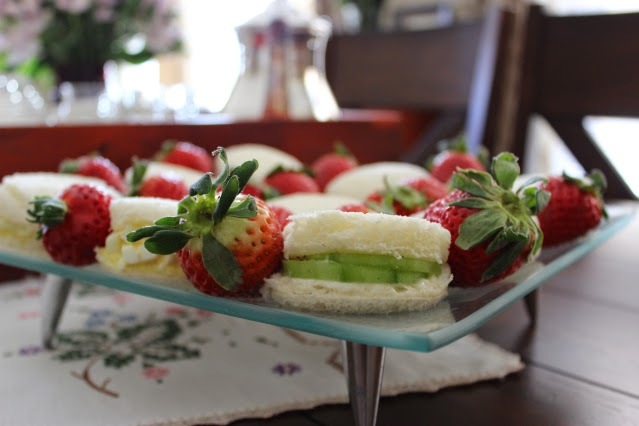 She had a beautiful vintage tea set as well as these yummy tea sandwiches. 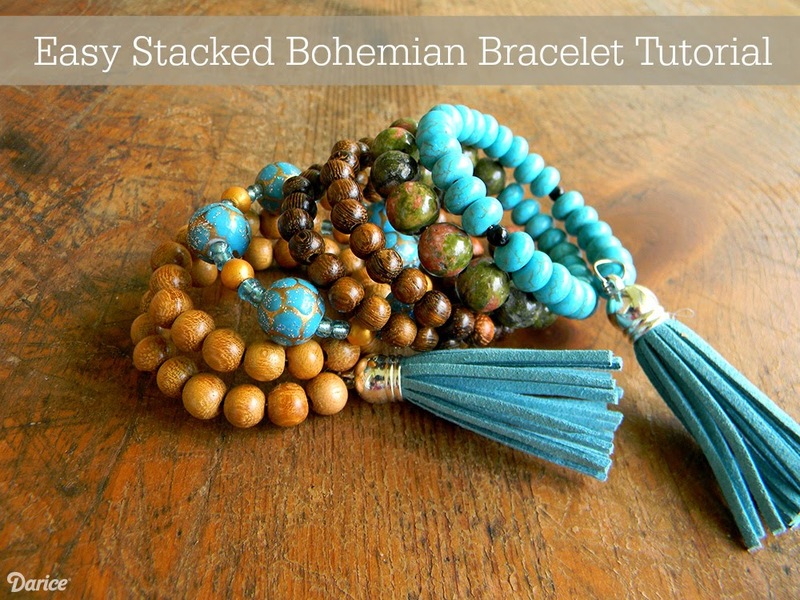 Brooke of Artistic Endeavors 101 shared this beautiful Stacked Bohemian Bracelet. I love turquoise and I could wear this with EVERYTHING! So let's get this party started for this week! Here are the party rules and, as always, thanks so much for sharing!! Please link to a specific post on your blog, not your blog's home page. 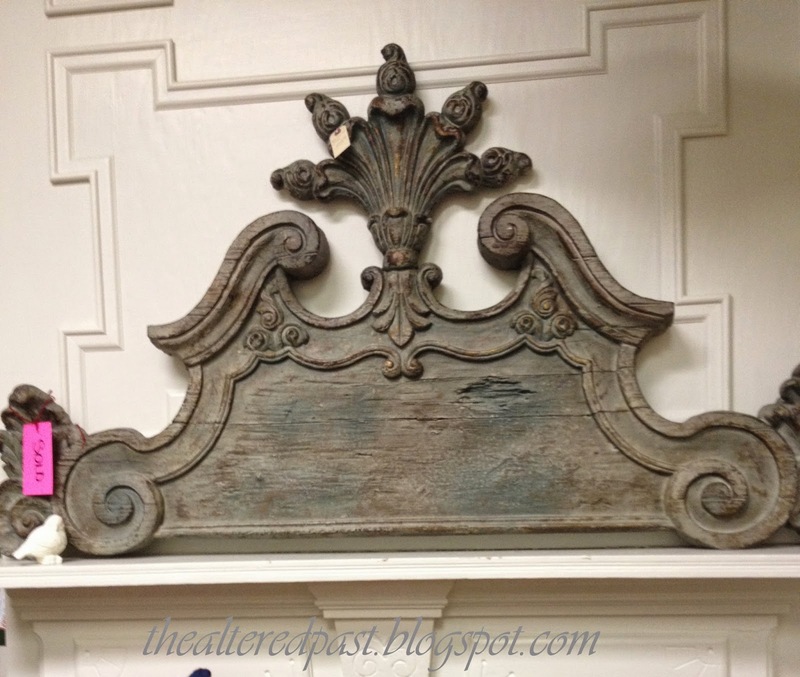 You may link up to 3 posts!